Welcome, everyone, to Varrock: one of the grandest cities in the land of RuneScape. This city is a location available to free players and members. Varrock has a lot to offer, such as quest start points, entertaining aspects, and much more. All of these interesting attractions will be explained with great amounts of detail throughout this guide. 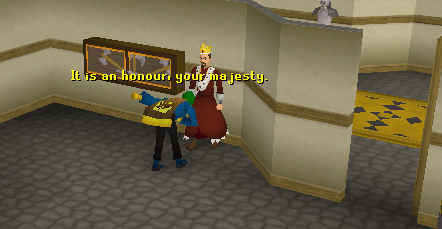 Before you can understand the glory of Varrock, you'll need to be there to see it. 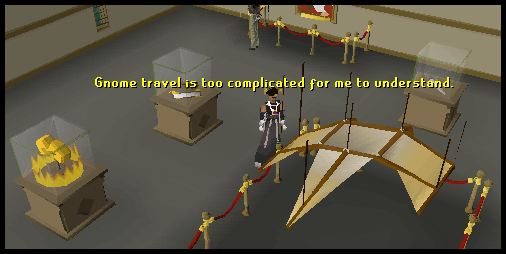 The below text will explain the different options of travel you can use to journey from one point of RuneScape to Varrock. Choose the best option for you, or experiment with all of them. Methods one and two (Magic Spell) are for free players and members, while methods two (Tablets), three, four, five, six, seven, and eight are members' only. Walking is the simplest of all traveling methods. It requires no special equipment except your feet, which are on you all the time. Simply walk to Varrock and enter from its north, south, east, or west entrances. It is not complicated to enter Varrock, so you shouldn't have much difficulty. 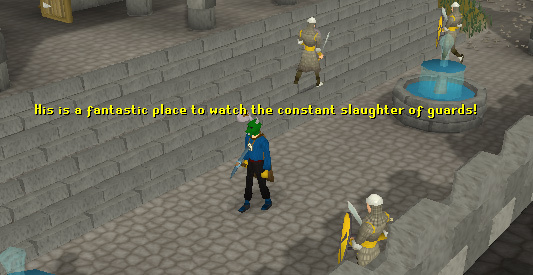 However, for players who have a low combat level, be wary when entering Varrock from the south entrance. Why? Well, nearby are some aggressive Dark Wizards that could possibly kill you. There are two types of teleportation methods: using runes or teleportation tablets. The most common method is with runes. Requiring level 25 Magic, you can teleport to Varrock with the Varrock teleport using three air runes, one fire rune, and one law rune. You will arrive in Varrock central plaza. The second teleportation option is teleportation tablets. These tablets are members' only and are crafted within your own or another's Player-Owned House (POH) that contains a study room. Your house or another's will need an Oak Lectern. 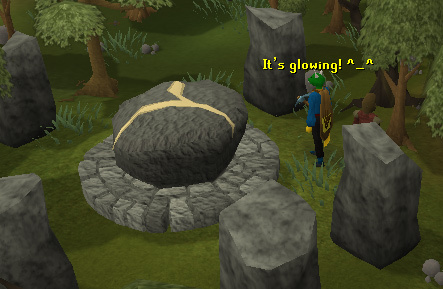 The necessary materials are soft clay and the Varrock teleportation runes. Teleportation tablets are a one-click teleport object and require no magic level to activate. This method is only for players who have a house and a portal room. Build a portal in your portal room and set it up for unlimited teleports to Varrock. This will require 300 air runes, 100 fire runes, and 100 law runes. Once the portal is set up, you can use the "Teleport to House" spell and use your new portal. This method is one of the fastest ways to access Varrock. For this method of travel, you will need completion of the quest, The Tree Gnome Village. This quest will access you to Spirit Trees. From your starting location, find a Spirit Tree and use it to teleport to the tree in the Varrock forest. From there, walk around the borders into Varrock or use the agility shortcut nearby. To travel to and from the tree in the Tree Gnome Stronghold, you'll also need completion of the quest, The Grand Tree. Canoes are uncommonly used to travel to Varrock. Nonetheless, they are still effective if you are out of runes or for other reasons. The only requirement is level 12 Woodcutting. Firstly, find a canoe station with a canoe tree nearby. There are four in RuneScape: Edgeville, Barbarian Village, The Champions' Guild, and Lumbridge. Head to one of these stations and prepare a canoe. Row a canoe to the Champions' Guild and then head north to the south entrance of Varrock. More information on using and preparing a canoe can be found in the Canoe Travel Guide. This method is only available to those who have completed the quest, Enlightened Journey. Firstly, you will need to start off on Entrana and use the hot-air balloon to fly to Varrock. This will require a tinderbox and ten willow logs. Once you have unlocked a route to Varrock, you can fly to the Varrock balloon station from any of the other balloon stations. You will need one willow log for any more trips. 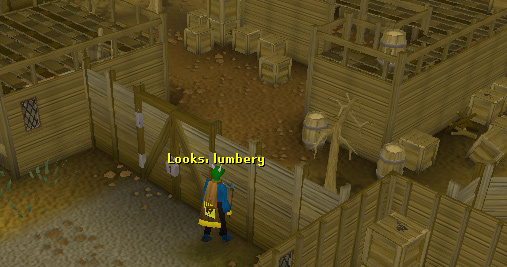 The Varrock station is near the Lumberyard. Once you arrive, head southwest to the east entrance. Enchanting a dragonstone bracelet creates the bracelet of combat. The bracelet of combat has a teleport option with a maximum of four charges to four different places. Use one of its charges to teleport to the Champions' Guild. Walk northeast to the south entrance of Varrock. Enchanting a dragonstone necklace creates a necklace of skills. The necklace of skills has a teleport option with a maximum of four charges to four different places. Use one of its charges to teleport to the Cooks' Guild. Walk south until you see a pathway, and follow this pathway east to the west entrance of Varrock. Located at point one, the first attraction in Varrock that is worth seeing is the Palace. The palace is north of Varrock's central plaza. It is three floors high with something appealing on each floor. Before you head into the castle, let us take a look at some of the attractions found in the palace's front yard and backyard. As you walk into the front yard of the palace, you will notice two benches. These benches are simply there for scenery and have no other potential use. You will also notice four regular trees. These can be chopped down for regular logs and are somewhat useful if you ever need a log quickly. Moving on, let us head to the next attraction, which can be found by moving west. Two fountains are located northwest of the left bench. These fountains are practical if you ever need to refill an empty bowl, vial, jug, or any other item that can hold water. Also, you will notice two statues west of each fountain. These statues are of famous knights. Their names are unknown. From the fountains, continue moving north along the path boarded by trees. You will come across a hole in the ground. 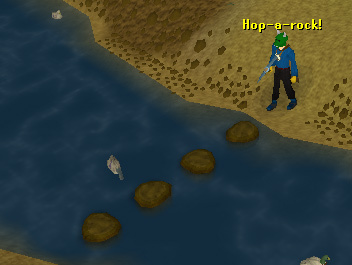 This hole is an agility shortcut, requiring level 21 Agility to use. This shortcut is two-ways. 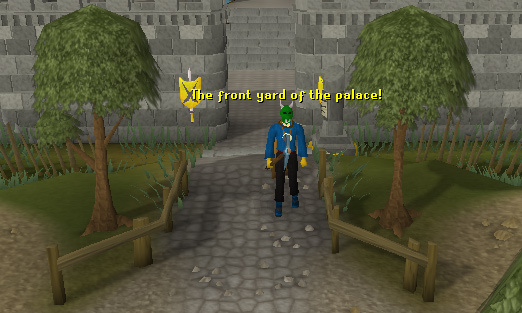 One way will access you into the backyard of the palace, and the other way will access you into the Varrock forest. Also, near the shortcut is a body rune respawn. In the very back of the Varrock Palace, you can find three yew trees. Yew trees require 60-Woodcutting to be chopped for logs. Be wary that this area could become crowded. Many free players come here for woodcutting. Unfortunately, autoers can also be found here. Between the yew trees is a lone table with some seats. As with the benches, the table is not useful in any manner and is there for scenery. East of the yew trees is a cage with a grizzly bear in it. 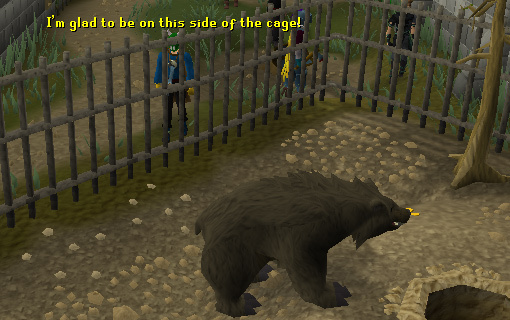 Players can range or mage the bear from the outside of the cage. If you want to get into the cage, you'll need to navigate through the Varrock sewers and find the ladder that goes up into the cage. The grizzly bear is level 21 and is also accompanied by a dying tree, five coins on the floor, and skeleton remains within the cage. Occupied at this location is the queen of Varrock. This is her garden. Players who have completed the quest, Garden of Tranquillity, will be allowed to visit this garden and will notice that it is furnished with plants, flowers, a white tree, and a Saradomin statue. Players who have not completed the quest will view an empty garden filled with weeds and empty pots. 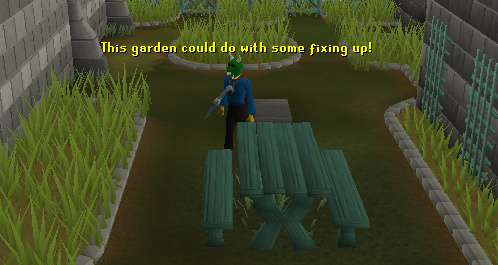 The garden will also be without a Saradomin statue. Also, here's an interesting fact, you can pick a white tree fruit in Queen Ellamaria's garden after completing the quest, Garden of Tranquillity. It restores 5-10% energy. You get 12-Farming experience for picking it. If you have been touring the Varrock palace via the descriptions in this guide, your current position should be in the queen's garden. For the next attraction, travel around the palace back to the benches. This time, move in an east direction. You will come upon a farming patch. You can grow trees in this patch. Wandering around the patch are the palace's guard and professional farmer, Treznor, and the Tool Leprechaun. Treznor can watch over your growing trees and chop down fully-grown trees, both for a price. He can also offer farming advice and sell basic farming equipment. The Tool Leprechaun acts as a farming bank and will only store farming equipment and different types of compost. Now that you have had the time to explore the front yard and backyard of the palace, it is time we start searching the inside of the palace. To start, head into the palace entrance, containing two fountains and multiple guards. The entrance to the palace itself can be reached by going north of the benches or west of the farming patch. Here at the entrance, you will find two fountains and four level 21 guards. These guards are constantly being killed by both members and free players. 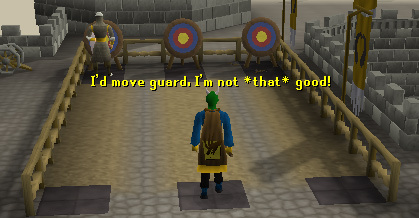 Members are attracted to these guards for their easy loot of a clue scroll. Free players are occupied with these guards for training. The fountains on the east and west sides of the entrance can be used to collect water with vials, bowls, etc. The ground floor contains some interesting features. The first attraction is right in front of you as you enter the palace. Behind the set of stairs is a level 17 Monk of Zamorak, locked up in a cage. Those who are new to the magic skill can be found in this area casting spells on this monk for experience. Continue to move and head to the east. You will appear in the King's throne room, containing the King himself, King Roald, and his advisor, Aeonisig Raispher. The King is apart of many quests, which include: Darkness of Hallowvale, Garden of Tranquillity, Priest in Peril, Shield of Arrav, and What Lies Below. Once you have finished exploring the King's room, head to the north. You will appear in the King's dining room. The room is currently empty without guests, so continue to head north. You will arrive in the palace kitchen. The kitchen is deserted of people, but does contain a sink, a range, and a pie dish respawn. Exit the kitchen and move west. The next room is the library. The library contains Reldo, who is featured in many quests, and Surok Magis, who is featured in the quest, What Lies Below. Reldo is also one of the start points for Varrock Tasks and rewards you with Varrock Armour 2 if you complete all of the medium tasks. The last attraction on the ground floor is to visit Sir Prysin. Sir Prysin is found in a little room in the southwest corner of the ground floor. He plays a major role in the quest, Demon Slayer. Also, Sir Prysin can sell replacement Silverlights and Darklights if you happen to lose your original. It is time to move up to the second floor of the castle. Head back to the entrance of the castle and walk up the stairs you first saw. The middle floor is plainer than the ground floor, but it still has some useful features. Head to the southwest and you will notice two rooms. The first room contains a single target. This is a private target and can only be used by the Varrock guards for range training. The second room contains two dummies. These dummies can be attacked for attack experience, but after a while, no more experience will be given. Once you have finished attacking the dummies, open the door on the northern wall. You will enter a long rectangular room filled with beds, lockers, and trunks. 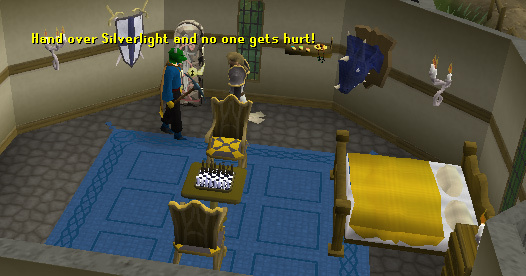 This is where a lot of the Varrock guards sleep. You might also find Ambassador Ferrnook in this room. He tends to wander around on this floor. Ambassador Ferrnook plays a part in the Activity, Gnome Restaurant. The last attractions of the middle floor are an enclosed room and a chapel. Both are found in the north part of this floor. The enclosed room is basically an enclosed room on the middle floor containing four level 21 Guards. To enter this room, you'll need to climb the staircase in the northwest corner of the ground floor. The chapel is next to the enclosed room. 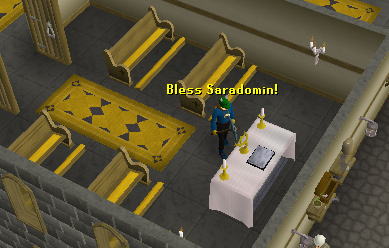 It is dedicated to Saradomin and contains an altar to recharge your Prayer Points. The top floor is also known as the roof. To get to the top floor, head back to the staircase you used to reach the middle floor. From there, head east into a fancy bedroom. You should notice a ladder. Climb the ladder and you will be on the top palace floor. The top floor is very plain, containing little attractions. 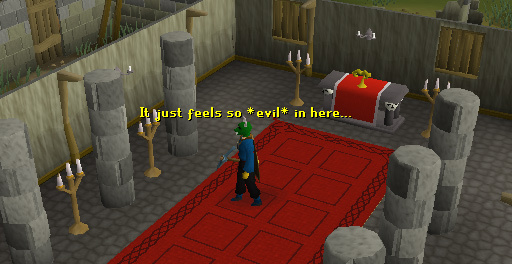 Exit the room you arrived in and you will come across a level 21 guard and multiple Varrock banners. Next, head to the north following a line of cannons and cannonballs. You should come upon a training area with a Captain and trainees. Neither the Captain nor the trainees are attackable. Near the training area is another enclosed room. This can be reached via the same way as the room on the middle floor. Once you enter the middle floor enclosed room, continue to climb the steps and you will be in a room with Captain Rovin. He has a role in the quest, Demon Slayer. Finally, the last attraction on this floor and the palace is a range training area. There are three targets aligned next to each other. Guards of the Varrock palace train their ranging here. It is a private range, so regular players cannot use it. Now that you have explored the lovely Palace, it is time to see what the remainder of the city has to offer. To view the second attraction, exit the palace walls and head west. Continue west until you exit Varrock and come upon a dirt road. Follow this dirt road and behold the second attraction. 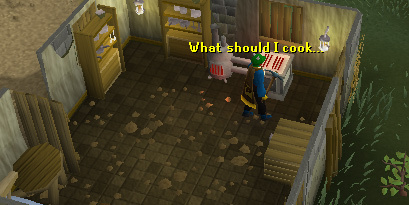 Our second attraction of Varrock is the Cooks' Guild. The guild is accessible for players with level 32 Cooking or above. It is also required to enter that you wear one of the following: a chef's hat, Varrock Armour 3, or the Cooking Cape of Achievement. Moving on, the guild is three floors high, each containing something useful. On the ground floor, there is Romily Weaklax, the Head Chef, and a bank. Romily runs a pie store and will sell a variety of pies. 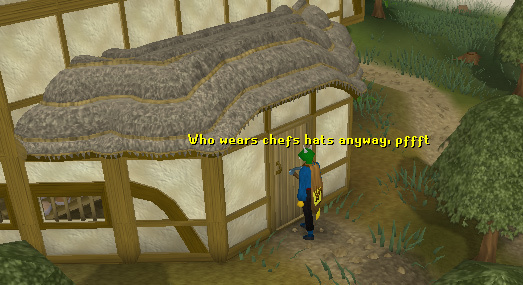 The Chef will greet you as you enter the guild and will also sell players with 99-Cooking a Cape of Achievement. The bank is only accessible to members who wear the Varrock Armour 3, meaning they have completed all sets of Varrock Tasks. On the middle floor and top floor, you can find respawns of useful cooking items. Also, the entire guild serves as a mill to make flour. Wheat can be picked in the backyard of the guild and the flour can be made inside. For a more detailed walkthrough of the Cooks' Guild, check out The Cook's Guild Guide. The third attraction of the city brings us to Gertrude's House. Gertrude is featured in the quests, Gertrude's Cat and A Tail of Two Cats. 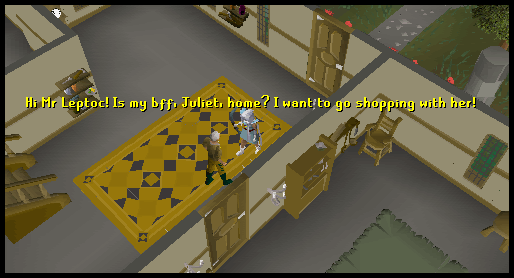 She can sell you kittens for 100gp each if you have completed the Gertrude's Cat quest. If you possess a Ring of Charos (a), you can charm Gertrude into giving you a kitten for free. You'll also have the ability to choose which color you want. Inside the house are two small children named Philop and Kanel. There is also a range in the northeastern room. Outside of the house are some swings and a washing line. Around the back of the house are doogle leaves. This grand house is featured in the quest, Romeo and Juliet. As you enter the house via the eastern most door, you will see a man walking around who is named Draul Leptoc. He is Juliet's father. In that room, you will find a staircase, which leads to the top floor. Around there is some fancy scenery. In the southeastern room is a range. The other items in this room are just for scenery. In the western rooms, you can find a dining room, a bedroom, and two other rooms. Each room is quite plain, except for the dining room, which has a fancy scenery to it. As you go up the staircase, in the northeastern room, you will enter a room containing a piano and a bookcase. Unfortunately, you cannot play the piano. On the wall, you can find a swordfish trophy and some shelves. The bookcase contains nothing interesting. This pink feminine bedroom contains some fancy scenery and some few drawers, which are empty. On the balcony is Juliet, who is featured in the quest, Romeo and Juliet. 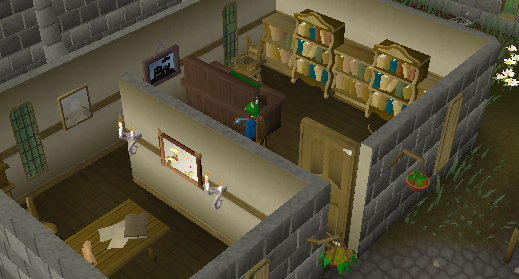 This is the biggest bank in Varrock. Here you can withdraw or deposit your money and items by using one of the bank booths. Banks are also a very popular place to trade items. 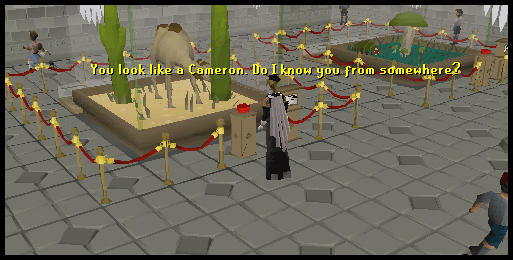 You can setup a bank PIN by talking to one of the five bankers standing behind their booths. At the southwest corner of the bank, there is an item deposit box. Directly east are some stairs, which lead to the bank vault. If you go north you will see a door. You can knock at it and say all sorts of funny things. If you descend the staircase found on the ground floor of the bank, you will be in the bank vault. Behind the bars are lots of valuable treasures like gold coins, ruby jewelry, bars, and necklaces. They can be telekinetic grabbed if you have a magic level of 33. 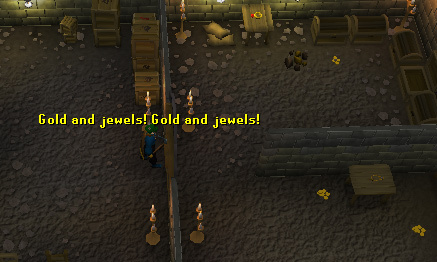 For more information on the Varrock Bank Vault, visit the Varrock Bank Vault Guide. Climbing the ladder that is north on the ground floor will access you onto the top floor. The other attractions located here are some chandeliers, paintings, and old bank booths. Welcome to Zaff's Staff Shop. This shop is located northwest of the plaza. Inside his shop, you will find Zaff himself. He is featured in the quest, What Lies Below. If you lose the beacon ring he gives you, talk to him to acquire another. By trading with Zaff, you can view his selection of staffs. He sells normal staffs, battlestaffs, and elemental staffs. Also, on a daily basis, you can talk with Zaff to buy battlestaffs for 7,000 each. He will only sell eight each day. The marketplace is a small shopping section in the northeast section of the Varrock plaza. At this small marketplace, there are three stalls: one fur stall, an empty stall, and a newspaper stall. To shop at the fur stall, talk to Bareak. He will sell you fur for 20 coins each. Also, you can sell him some fur that you come across. His prices will vary. 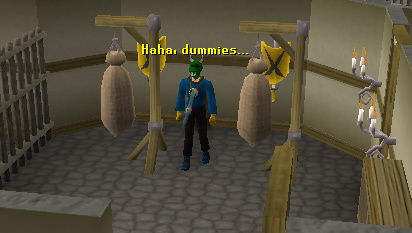 Unlike the stall in Ardougne, you cannot steal from his stall for free furs. Near the fur stall are two boys: Wilough and Shilop. They are the sons of Gertrude and play a role in the quest, Gertrude's Cat. Near the two boys is Bennie. If you talk to him, you can buy the Varrock Herald for 50 coins. The newspaper contains information about the city, news about deaths, and some obituaries. Number eight on the map brings us to the central plaza. This place is an important part of the city, as this is the place where you will arrive if you teleport to Varrock. In the center of the plaza is a grand fountain. Here, you can fill up vials, bowls, jugs or any other item that can hold water. 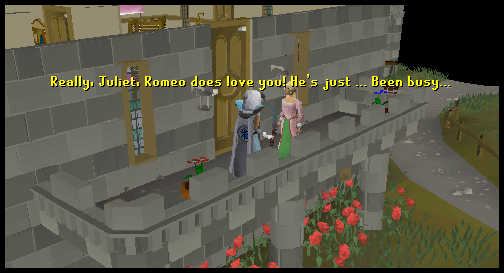 Also, you can start the Romeo and Juliet quest by talking to the distressed Romeo who is holding flowers. In addition, the plaza is a good place to trade with other players. The Gypsy's tent is located south of the staff shop. It has a sign with an eye on outside. Inside the tent is Gypsy Aris. She plays a key role in two quests: Recipe for Disaster and Demon Slayer. 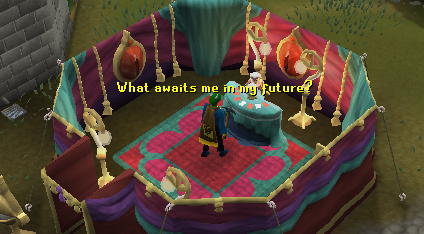 For players who haven't started either of those quests, you can give the Gypsy a gold coin and she will "reveal your future". The General Store is a popular place to buy or sell items. It's located southeast of Gypsy Aris' tent. In the general store, you will find two shopkeepers. Trade with one of them and you can view their stock. Also, if you climb the ladder that is leaning on the south wall of the shop, you will enter a room that has a spade and knife on the floor. You can pick these up. Southwest of the general store is a useful sword shop. The store sells bronze swords to adamant swords, bronze longswords to adamant longswords, and bronze daggers to adamant daggers. Also, upstairs in this shop, you can find a cooking range. North of the sword shop is a clothing store, entitled "Thessalia's Fine Clothes." Here, you can buy basic robes, skirts, leather armor, and more. In addition, if you are tired with your current look, you can ask Thessalia to change your default clothing. It will cost 1000 coins for a pants and shirt change. Players who have received a frog token from the Frog Random Event can exchange it with Thessalia for a frog head or a prince/princess outfit. Lastly, against the northern wall of the store, there is Iffie. She is Thessalia's sister and is found happily rocking on her rocking chair. South of the west bank is a building containing three anvils and the Master Smithing Tutor. 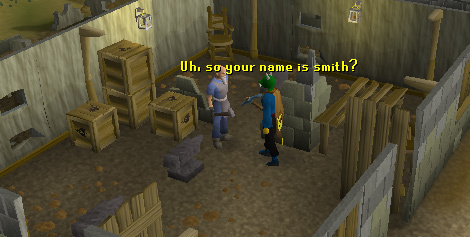 The Smithing Tutor will provide you with helpful information to help raise your smithing skill. 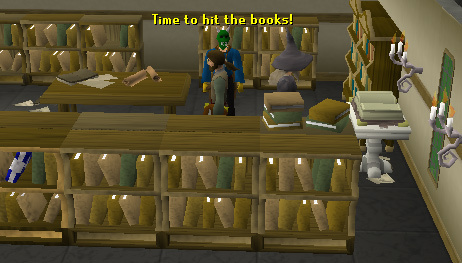 Unfortunately, he does not give any free supplies similar to the combat tutors in Lumbridge. The Apothecary is a very important person in Varrock. He is very useful to free players: if you bring him 5 coins, a limpwurt root, and red spider eggs, he will make you a strength potion (4). He is also a key character in Romeo and Juliet. For members, he is featured in the quests, One Small Favour and A Tail of Two Cats. Also, if you lose your doctor or nurse hat from the quest, A Tail of Two Cats, you can ask the Apothecary for a replacement. South of the Apothecary is the headquarters for the Black Arm Gang. 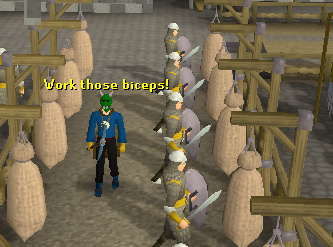 The Black Arms are a Varrock gang who are featured in two quests: Heroes' Quest and Shield of Arrav. Katrine, who runs the gang, can be found in the southwestern room. Also in that room, there are two level 16 thieves. If you are a member of the gang, you can walk into the northwestern room via the door in the southwestern room. In there, you can find two level 16 thieves, and a staircase that leads upstairs. Upstairs is a cupboard, containing half of the shield of Arrav. Continuing south, you shall approach an empty tower. This is a very boring location. It isn't featured in any quests, and is only in Varrock for visual purposes. Walking around near the tower is a tramp named Charlie, who you can get information off for the quest, Shield of Arrav, by bribing him with money. Also, a small building is to the south, which contains a table and sometimes a level 21 guard. This attraction, similar to the last one, is quite boring. The house on the west contains a range and a ladder, which leads to a room upstairs. In the garden outside the house, there is an allotment, which contains cabbages that you can pick and eat to heal 10 Life Points. There are also some empty sacks. In the eastern house, there is a staircase and another range. The Blue Moon Inn is one of three pubs in Varrock. In this pub, you can buy a normal beer by talking to the Bartender. In addition, you will find Jonny the Beard, whom you'll need to kill in the quest, Shield of Arrav, if you are apart of the Phoenix Gang. He is level 2. 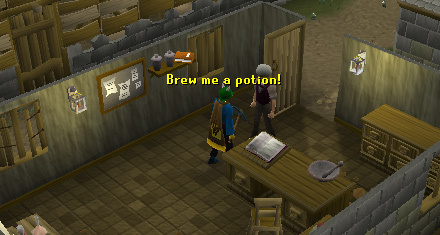 Walking around is Dr. Harlow, who gives you advice in the quest, Vampire Slayer, on killing Count Draynor if you give him a beer. Upstairs in the pub, there are two level 2 men. If you look in the northeastern room there is a chest, which you need to unlock and search in the quest, Pirate's Treasure. Lastly, the Blue Moon Inn plays an important role in the Alfred Grimhand Barcrawl. Here is where you can buy an Uncle Humphrey's Gutrot. East of the pub, a dilapidated house can be found. Inside, two fireplaces can be found, as well as a level 2 man, which you can attack. There are also some crates, which when searched, contain nothing. South of the dilapidated house, you can find the entrance to the hideout of the Black Arm Gang's biggest rival: The Phoenix Gang. 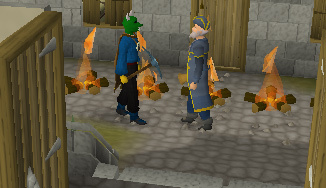 The Phoenix Gang is another Varrock gang who is featured in two quests: Heroes' Quest and Shield of Arrav. The entrance to their hideout can be found by opening a door on the western wall of the connected houses. Climb down the ladder and you will appear in front of Straven, the Phoenix Gang's leader. Straven can replace two particular items if you have lost them. Those items are the thieves' armband from the Heroes' Quest and the weapon store key from the quest, Shield of Arrav. For those apart of the Phoenix Gang, you can continue to search the hideout by opening the southern door. Black Arm members cannot continue any further. East of the Phoenix Gang hideout is a temple dedicated to Zamorak. Inside, you can find the Mage of Zamorak along with an altar to recharge your Prayer Points. Some players might not see the Mage of Zamorak. 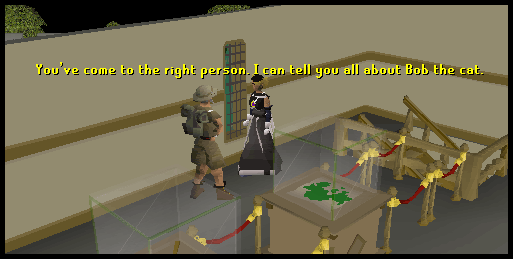 In order for him to appear in the temple, you'll need to speak with him in level 4 to level 6 wilderness north of Edgeville. Also, note that the mage will refuse to speak with you if you are wearing Saradomin or Guthix items. Moving on, the Mage plays a part in the miniquest, Zamorak Mage, and the quest, Wanted. 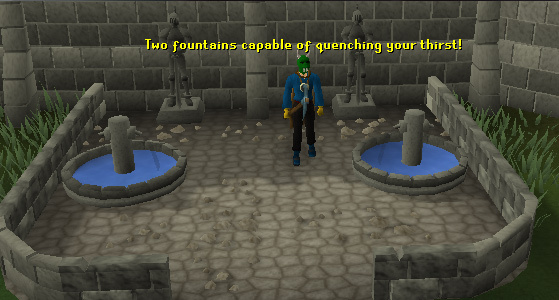 With completion of the miniquest, you'll learn the secrets and techniques of using the wilderness Abyss. While the Zamorak Mage is the main importance of the temple, the temple itself plays a role in the quest, Merlin's Crystal. The next attraction is located in a small, enclosed area. 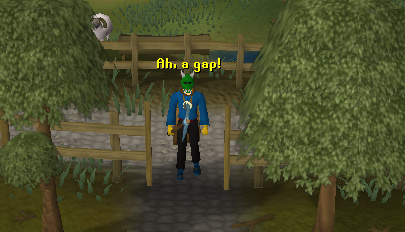 Head a little bit north of the Zamorak temple and you should notice a gate. Open the gate and the Rat Pits are just a bit south. This is the place where cat owners can take their grown cats and enroll them in the Activity, Rat Pits, which requires completion of the quest, Rat Catchers. You will need some money to place bets and an Amulet of Catspeak to speak to your cat. The basic idea of the Activity is to see whose cat can catch the required amount of rats first. For this specific rat pit, the number is seven rats. Be wary that your cat may die during this Activity. West of the entrance to the Rat Pits is a duplex building. The top half belongs to Dimintheis. Dimintheis is the quest start point for the quest, Family Crest. He can also replace your steel gauntlets, the reward from the quest, if you happen to misplace them. The bottom half of the duplex building is the Fancy Clothes Store. This store is only accessible to members. The Fancy Dress Shop Owner owns the store. His shop contains some interesting and unique pieces of clothing. Trade with him and behold your choices. You can also bring the Fancy Dress Shop Owner some furs you've obtained from Hunting and he can make some interesting pieces of clothing, for a price. 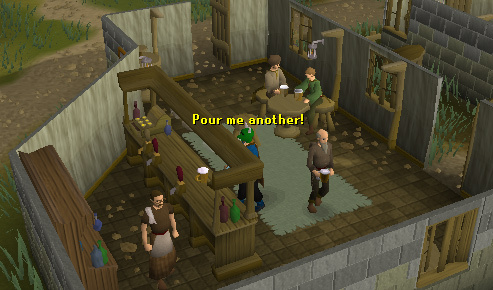 Welcome to the smallest pub in Varrock. Here you can buy beers for two coins each. Also, for those who have completed the quest, Biohazard, Chancey, Da Vinci, and Hops can be found in the pub drinking beers in a drunken phase. Southeast of the pub is the house where you visit Guidor in the quest, Biohazard. Guidor tests your chemicals and determines that there was really no plague. The house has three rooms, containing Guidor and his wife who wanders around. This is simply a house that no one lives in and is falling apart. There are two rooms downstairs and two rooms upstairs. The downstairs' area is quite boring. Upstairs is boring too, unless you are in the process of completing the quest, Rat Catchers. Upstairs is the area when your cat must fight the Rat King. Here at the rune shop, you can buy the basic elemental runes, along with mind, chaos, and death runes. For those who have achieved 99-Runecrafting, the owner of the store, Aubury, will sell the Runecrafting Cape of Achievement for 99,000 coins. In addition, after completing the quest, Rune Mysteries, Aubury can teleport those to the rune essence mines where regular and pure essence can be mind. This is the most popular place to teleport to the Essence mine since the Varrock east bank is a very short distance away. On another note, below are the prices for buying runes in the store. The prices can vary depending on the amount of runes in the store. 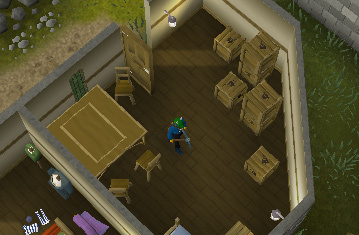 Next door to the Rune Shop you can find a small house containing two anvils for all your smithing needs. This building is built with two floors, with the top floor containing two beds and a small table. Another duplex house can be found east of the smithing house. This duplex contains a cooking range in both halves. The only significant different between both halves is the south half contains two level 2 Men. This is the place where thieves are placed if they are caught thieving. 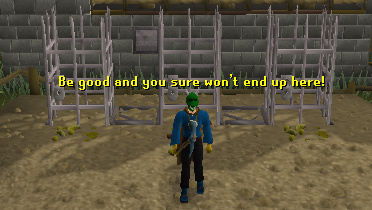 Players can be placed within these cages at random points while pickpocketing. This is considered a random event and only happens to members in members' worlds. If you are locked within a cage, you must complete a simple puzzle to free yourself. As you try to complete the puzzle, a local Tramp will throw rotten tomatoes. 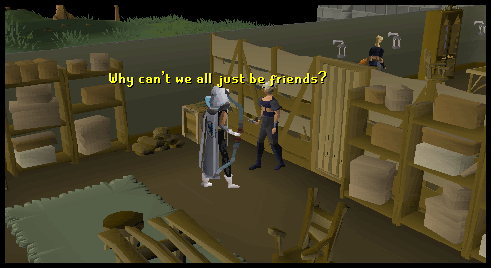 Welcome to Varrock's Archery shop. The storeowner, Lowe, stocks arrows, from bronze through adamant. He also stocks shortbows and longbows, from the basic regular bows to the more expensive maple bows. Additionally, he stocks regular crossbows and bronze bolts. North of the archery store is another one of Varrock's glorious shops. This shop sells a variety of armour. Also, two anvils are located in this shop, useful to players who quickly need to smith metal bars. The east bank is a smaller version of the west bank. It is especially helpful for banking rune essence that you may have mined in the rune essence land, accessed via Aubury's Rune Shop. In the east bank, you can trade and access your bank account by talking to a banker. Upstairs in the bank is a small room containing a bank vault. At attraction thirty-three, there is a tea stall. You can trade with the Tea Seller to buy a cheap, nonetheless useful, cup of tea. One cup of tea costs 10 coins. However, as you may have guessed from this being a stall, you can steal tea. Stealing tea gives 16 experience per cup stolen. The stall requires a thieving level of five. North of the east bank is a building where many dummies are found. 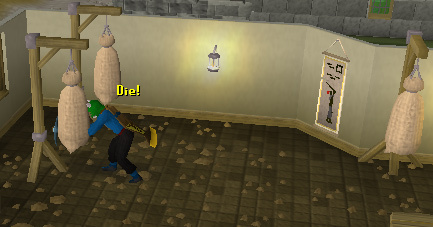 Players can train on the dummies at low combat levels for small amounts of experience. However, players will no longer receive experience if they have an attack level of twelve or higher. This house is only in Varrock for scenery. It has no real importance. Inside there is a bookcase, which contains no interesting books. If you open the door to the south and climb the stairs there is a bedroom. In the bedroom is all the typical furniture you would expect. North of the local house is a manhole. 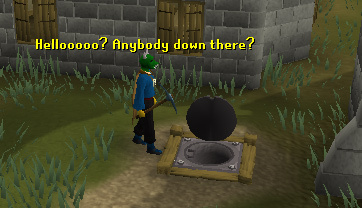 This manhole leads to the dirty and disgusting Varrock Sewers. Many interesting features can be found down in the sewers, so check out the Varrock Sewer Dungeon Guide for more information. 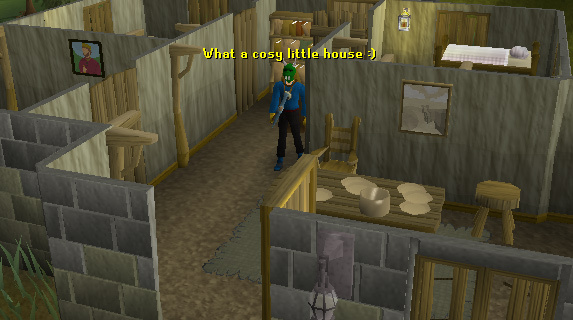 East of the Varrock Sewer manhole is a very small house. This small house is only suitable for one person. Outside of the house, there are some pretty plants with tables and chairs. Inside the house, there is a bookcase and a bed. Did the appearance of the small house bore you? Do you think you could build a better one? If so, northwest of the very small house is the home of the Estate Agent. The Estate Agent can sell you your very own house for 1,000 coins. At first, your house will be plain and boring. As you advance in Construction levels, you can redecorate it. Along with selling houses, the Estate Agent can move houses, redecorate houses, provide information on houses, provide free Construction guidebooks, and sell players with 99-Construction the Construction Cape of Achievement. East of the Estate Agent's home is the beautiful, four-story Varrock church. The Varrock church is a place where many adventurers will come to restore their drained Prayer Points. Outside of the church, there is a yew tree that requires 60-Woodcutting to chop down. On the ground floor, you'll find Father Lawrence. He is the church's priest and has a role in the quest, Romeo and Juliet . Also on the ground floor, there are two residents sleeping in Church. Their names are Martina Scorsby and Jeremy Clerksin. On the middle floor, you'll find Elsie. She will tell you a story if you bring her a cup of tea and can offer tips on becoming rich. On the top floor, you'll appear in a messy bedroom. Finally, on the roof, there are no attractions other than a great view of a section of Varrock if playing on High-Detail. This house is not very important. There are no NPCs. You can only find beautiful furniture here. However, if you climb the stairs and exit the door on the east wall, you can view the beautiful backyard of the Varrock Palace. North of the scenery house is a small house populated by two guards. 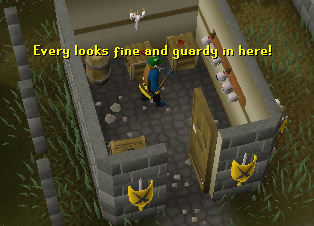 These guards wander in and out of this house, making sure that Varrock is protected from its north entrance. Point forty-three brings us to the entrance to the wilderness. If you accept the warning message that appears when you attempt to cross the ditch, you will cross the ditch into the wilderness. Beware! Only venture north from here if you are fully prepared and understand the risks the wilderness contains. The Jolly Boar Inn, sometimes referred to as the wilderness pub, contains many men and thieves, as well as one Black Knight. Beer can be purchased from the Bartender for two coins. To the east is a staircase. If you climb it, you will be in a room containing Johnathon, a poisoned brother from the quest, Family Crest. Also, outside of the bar, on the western side, is a single yew tree that requires 60-Woodcutting to chop down. 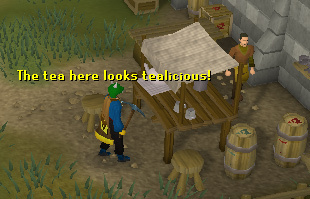 East of the Jolly Boar Inn is the Varrock Lumber Yard. There are a lot of crates in the Lumber Yard. Some crates have a "Mew!" emanating from them. There are kittens inside them, but don't expect them to always come out if you search their crate. Toward the center of the Lumber Yard is a ladder. Climb the ladder and you'll appear in an area containing Gertrude's Cat. Gertrude's Cat plays a part in the quest, Gertrude's Cat. She will return to Gertrude once her kitten is rescued and brought to her. The kitten can be found in one of the crates where "Mew!" is originating. This person is extremely important if you are training the construction skill. He can sell you all sorts of items associated with the skill. He can also make planks from your wood. Of course, he does not do this free. You'll be expected to pay 100 coins for normal wood, 250 coins for oak wood, 500 coins for teak, and 1,500 coins for mahogany. Below you will find listed the items he sells if you trade him. Here you can find the temple at which earth runes are crafted. To enter the temple, use an earth talisman with the mysterious ruins or select the enter option whilst wearing a tiara. Once inside, you can craft your runes from either rune or pure essence. 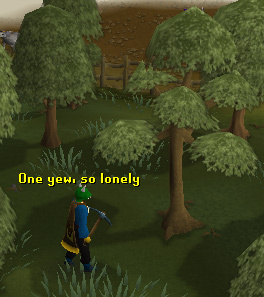 To the south of the ruins is a yew tree, which requires level 60 Woodcutting to be chopped. The third attraction of point 47 is a Hot-Air Balloon. This can only be used and seen by players who have completed the quest, Enlightened Journey. 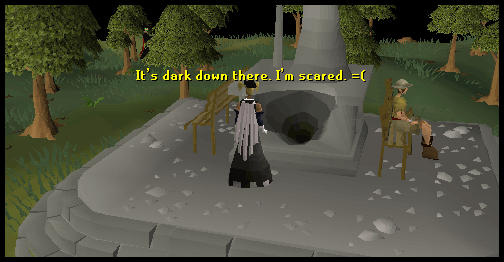 At this attraction, there is a statue of Saradomin. If you havent reached the part of enchanting the wand in the quest, What Lies Below, then the statue will look normal without a hole in the south side. If you have reached that part of the quest, there will be an entrance that will lead to the Chaos Altar in the wilderness. An NPC called Anna Jones is sitting on a nearby bench. She helps you open the statue. 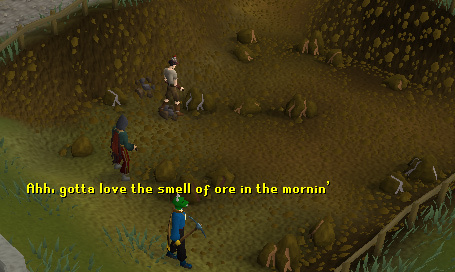 To make use of this attraction, you must be training the mining skill. In this mining pit, you will find four iron, ten copper, and six tin rocks. They require a pickaxe to be mined and to have the required mining level to mine the rock. Here you can find Rat Burgiss. He is the start of the quest, What Lies Below. Reldo is also one of the start points for Varrock Tasks and rewards you with Varrock Armour 1 if you complete all of the easy tasks. Near him, his cart can be found, which contains some fruit and a bag. Also, near Rat Bugriss, there is a signpost that gives useful directions for newer players. This area contains a couple of berry bushes. The berries that grow on these bushes are Cadava and Redberry. 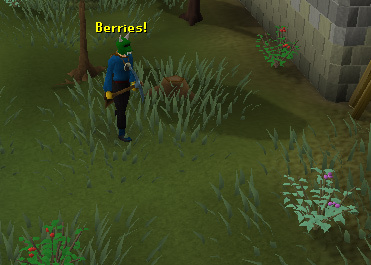 Berries are used for multiple reasons, primarily cooking, quests, and making dyes. Slightly west of the previous attraction, the berry bushes, is a yew tree. You'll need level 60 Woodcutting to chop this tree down. Another advantage to this tree is the lack of autoers. It is isolated from regular yew trees. Surrounding this special tree are some normal trees and a few oak trees. Welcome to the small, Varrock farm. Inside this farm, one would expect animals, and this farm is no different. If you enter via the southern gate, you will be greeted by some sheep, which can be sheared using shears. Their wool comes in handy for crafting or the quest, Sheep Shearer. In the pond are some delightful swans, and just near the pond are two willow trees, which can be cut using an axe with a woodcutting level of 30. In addition, walking around the farm may be a Master Farmer. 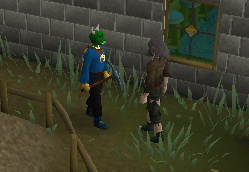 You can pickpocket him at level 38 thieving and could obtain some seeds or farming equipment. 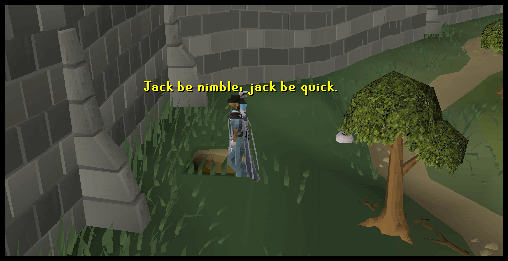 Here you can find a shortcut leading to the path to Lumbridge. It is a simple opening in the fence that will make your journey much shorter than if you had to walk all the way around the fence! To the west of this is another shortcut, but is a members only feature. To use it, stand a few steps back, then your character will take a running jump at the fence and leap over. At this area, you can find some useful wheat blowing in the wind. To get some wheat from here, open the gate and choose the option to pick wheat. Once you have your wheat, you can do all sorts of brilliant and exciting things. If you take the wheat to a Windmill with a pot, you could make some flour, which is used in cooking. Before you even go near this place, be warned: The wizards are level 7 and level 20. The level 7s will attack anyone with a combat level below 15. The level 20s will attack anyone with a combat level below 41. Now that thats out of the way, lets move onto the description of this attraction. Well, this area contains many Dark Wizards. If killed, they drop many exciting items, including runes and robes. The high level wizards use earth spells and the low level wizards use water spells. This area is also featured in the quest, Demon Slayer. This is where you will slay Delrith if you are doing the quest. You will need the sword, Silverlight, if you wish to kill the demon. This is one of the places where you are ride a canoe. In addition, this is a place where you can travel to via other canoes if you choose to go to the Champions Guild. You will need an axe to make a canoe, and the required woodcutting level to cut the canoe. The NPC Tarquin is here, who will provide you with information about the canoes. 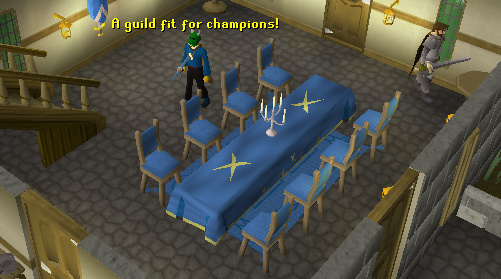 The Champions' Guild is a place where the champions in RuneScape can reside. You'll need 32 quest points to enter, and inside you will find the Guildmaster, who is the start point for the quest, Dragon Slayer. Some chickens can be found outside, and upstairs are two stores that both sell armour. 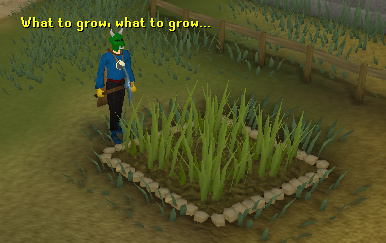 Attraction number 59 is a bush patch, used in the farming skill. You can grow any bush, from Redberry to Poison Ivy bushes. Your well-known Tool Leprechaun can be found here. He will look after your tools and other farming supplies, and the other NPC Dreven will look after your bush for a small fee. Also, there is a short bridge cutting across the Lum River. This is a handy shortcut that will really save you some time. Here you can mine ores, using the mining skill. To make use of this area, bring along a pickaxe. In this mine, there are seven tin, three silver, three iron and three clay rocks. 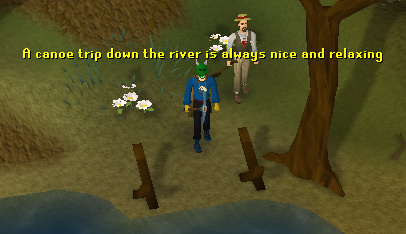 Here you can find a useful agility shortcut over the River Lum. 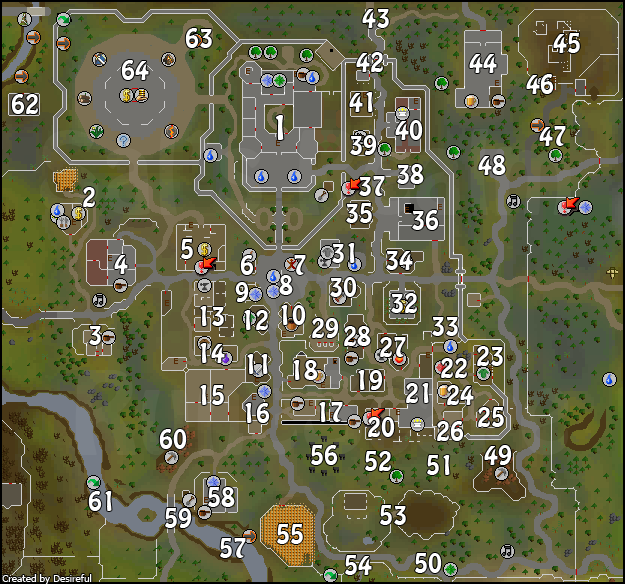 The shortcut is two ways and goes between the Champion's Guild and Draynor Manor. To use this shortcut, there is a required agility level of 31. The next attraction isn't close to the previous agility shortcut. Travel around the Grand Exchange (towards Edgeville). Once you are on the western side, go west until you see a house. This house belongs to Lucien, who is an important figure in the quest, Temple of Ikov. 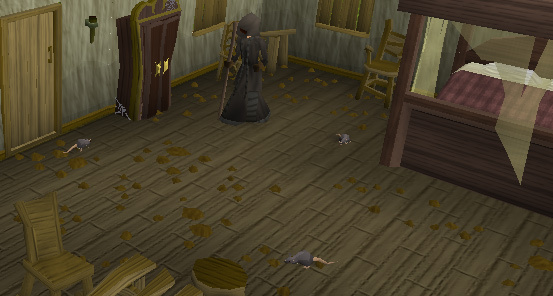 Players who agree to help the Guardians of Armadyl will need to come to this house and kill the level 14 Lucien. 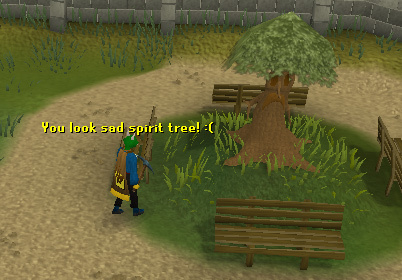 In the north-eastern corner of the Grand Exchange, you will find the Spirit Tree. The Spirit Tree is one of the many ways to travel around RuneScape. Speak to this Spirit Tree and you can travel to the Battlefield of Khazard (near Ardougne), the Tree Gnome Stronghold, the mountain pass to the east of the Poison Wastes, and any personal Spirit Tree you've grown in Port Sarim, Etceteria, or Brimhaven. In order to grow your own Spirit Tree, you'll need level 83 Farming. Finally, to use any Spirit Tree, you'll need completion of the quest, Tree Gnome Village. 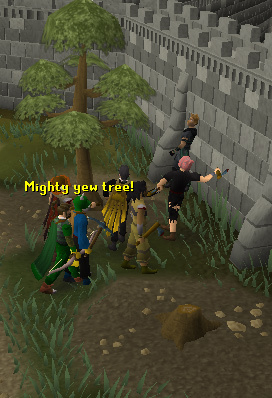 Also, to use the tree in the Tree Gnome Stronghold, you'll also need completion of the quest, The Grand Tree. Lastly, you'll need completion of the quest, The Path of Glouphrie, to use the Spirit Tree in the mountain pass. Just west of the Varrock Palace, you'll find one a major attraction: The Grand Exchange. This is a place where players can buy and sell items to one another. However, it gets better. You have to do absolutely no work! The Grand Exchange will take all of the hassle out of buying and selling items across RuneScape. Please see the Grand Exchange guide for more information. 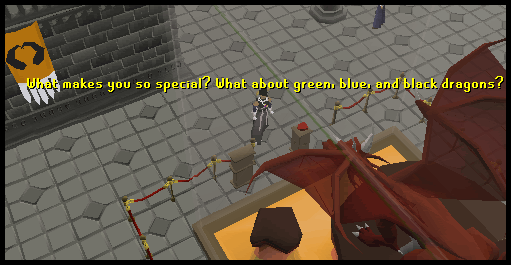 There are five special attractions in Varrock that are more unique than the average attraction. Most of them are a bit difficult to find, mainly because they are constantly moving or only appear at random times. 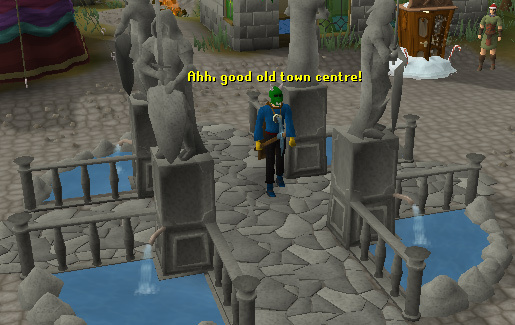 The Town Crier is a useful man who is usually located in front of the Varrock East Bank. He can be useful to newer players and some veteran players. The Town Crier specializes in explaining some things about Player Moderators. He also has a copy of the Rules of Conduct. If you ask him, he'll show you a book containing a brief description of the fifteen rules. Lastly, the Town Crier can give away some handy tips, such as small scam prevention tips and combat tips. The Tramp is located somewhere near the ragged houses south and west of the Varrock Rune Store. If you speak with the Tramp, he'll ask for some spare change. If you have money in your inventory, you'll have the option to give him some change or deny his request. If you say yes, you'll give him one coin. If you say no, you'll preach about earning money yourself. 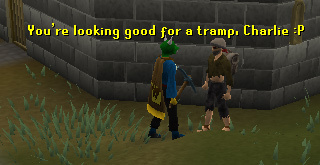 The Tramp will become angry and will shout words against you, such as, "<Your RuneScape Name Here> is mean!" Stray Dogs wander in different parts of Varrock. One is found near the west exit, another near the south exit, and one near the east exit. The dogs are not exactly in those locations, as they do wander around in the general area. Anyway, these dogs are abandoned, hungry, and randomly follow players that come near them. You can do three things to do the dogs: you can feed them bones of any kind, feed them meat, or shoo them away. It's not very nice to shoo the dogs away, so if you have a piece of meat or some bones with you, give it to them to make them happy. 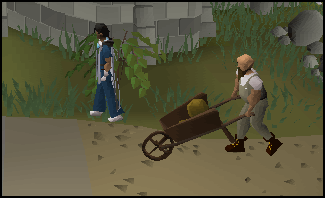 The Digsite Workman is an event that happens every few minutes near the back entrance of the Varrock Museum. 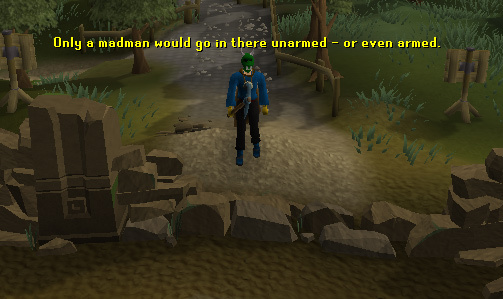 A Workman will enter Varrock from the east entrance and turn toward the Varrock Museum. He will enter the Digsite Exhibit Archeology Cleaning Area and drop off a pile of specimen rocks from his wheelbarrow. He'll then turn around and leave the city. The exact time frame of when he'll show up again is unknown. The last of the special attractions is the cleaner. 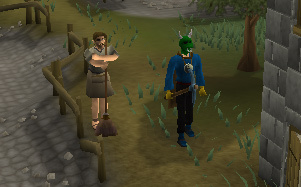 The cleaner wanders around the Varrock East Bank, south of the Varrock Museum, and east of the Armour shop. He is a silent NPC that you cannot talk to - only examine. All he does is clean: he sweeps his broom all over the place and randomly stops to take breaks. 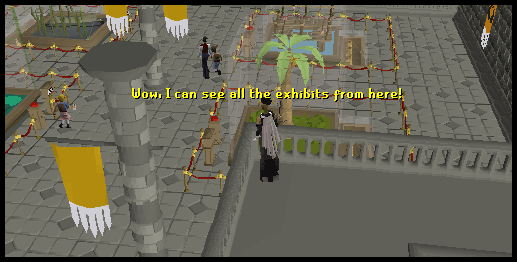 Before Varrock's massive update in May 2007, the museum was a boring attraction containing few displays. As of today, the museum is a fantastic and marvelous attraction, located at point 36, that everyone in Varrock should come to see. 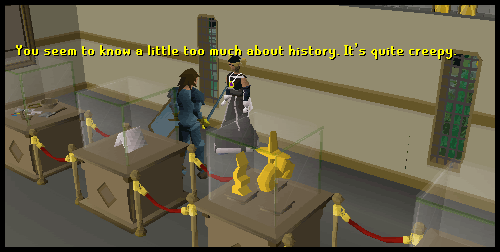 Many people come to the museum to complete the Varrock Museum Miniquest. A separate guide is available for those who wish to complete this miniquest. In this guide, however, you'll learn about and view the great attractions found within the museum. The Digsite exhibit is located on the ground floor when you first enter the museum. Eleven display cases are available to view. All cases contain special artifacts found at the Digsite. Some cases are missing artifacts. You'll have to find these artifacts yourself by searching through the specimen rocks at the south end of the ground floor. 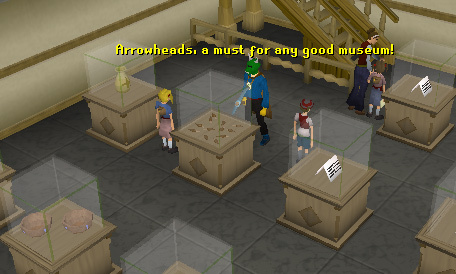 This is one part of the Varrock Museum Miniquest. To begin searching, you'll need completion of the quest, The Digsite. If that quest is completed, speak with the Museum Guard and he'll let you into the archeology cleaning area. While searching for these artifacts, you'll earn museum kudos that can benefit your museum experience. Once you are done playing with rocks, exit this area and head to the northwest corner of the ground floor. You'll locate the information booth and the Information Clerk. The booth and the clerk can tell you information about the three exhibits and kudos, along with offering free maps of the museum. A giant map of the museum is located on the west wall of the clerk. Lastly, a few NPCs are found on this floor. There is the Museum Guard, who's been mentioned already, along with the Information Clerk. A NPC you've probably seen is Curator Haig Halen. If you speak with him, he'll tell you about an interesting island the museum staff found north of Morytania. You can also have a humorous discussion with the Curator on finding treasure. Another set of NPCs are the schoolgirl, schoolboy, Teacher, and Pupil. The Teacher and Pupil skip around the Digsite Exhibit while the schoolgirl and boy wander around alone. The Timeline Exhibit is found by ascending the staircase in the northeast corner of the Digsite Exhibit. The first person you'll meet in the new exhibit is Historian Minas. He can help you out by telling you some information about the museum. Also, you can help him out by providing information for the display cases based on the information you've obtained from quests. Continuing west, you'll come across Torrcs. He is wearing rune armor and has brown hair. If you speak with him, you'll learn he is a history buff who enjoys viewing the display cases. Sometimes, Torrcs will tell you some interesting facts and will express his opinions on the different exhibits. Another fellow that has the same interests as Torrcs is Marfet. He is found at the southern part of this exhibit. You can speak to him about many things, such as the different exhibits, the Digsite, and newly learned facts from the display cases. The Timeline exhibit does not end here. Head to the staircase in the southwest corner and rise into the second part of the exhibit. One of the first attractions you shall notice is a great display of a gnome glider. Another interesting attraction is a person. A little bit northwest of the glider is the museum's finest and only art critic, Art Critic Jacques. Jacques is of a French background and his accent is pure in his conversations. You can ask him who he is and what he does for the museum. Lastly, another Teacher and Pupil are found in the museum. As usually, the Pupil is excited and energized about history and drags the teacher to wherever her heart desires. No picture can be provided of the Teacher and Pupil because they cannot stand still and are too busy learning. The last exhibit the museum has to offer is located underground. Head back to the Digsite Exhibit and descend the grand staircase in the northwest corner. You'll appear in the largest exhibit located in the museum. The first person you'll see is Orlando Smith. If you talk with him, you'll learn about a job you can do to earn Kudos. The job is to go around the display cases in the Natural History Exhibit and complete a small quiz about the displays. Information about each display can be obtained from speaking to the Natural Historian, one found in each part of the Natural History Exhibit. Let us start exploring the display cases, shall we? Head to the northern part of the Natural History Exhibit and you'll find four large display cases. In order, these display cases contain: a desert lizard, a battle tortoise, a red dragon, and a wyvern. Of course, these are only models and not the real things. If real, these creatures would have broken out of their glass containments and killed someone. Moving in a clockwise rotation, head to the eastern exhibit to find four new displays: a snail, a snake, sea slugs, and a monkey. The southern exhibit only contains two display cases. 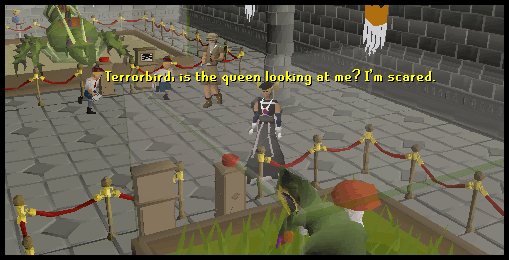 From left to right, they are a terrorbird and a Kalphite Queen. Finally, the western exhibit is the last exhibit to see in the Natural History Exhibit and the overall museum. Moving clockwise, the displays are: a camel, leeches, a penguin, and a mole.